I make decisions out of a clear mind. I used to get a stomach ache anticipating a difficult conversation, now I'm looking forward to them. I'm moving towards leading from connection, not a strict sense of authority. I notice I'm more approachable. My best friend sees my growth! I have clarity and peace. I notice some of my coping strategies are no longer working for me; in fact they are taking me back. I’m a much better manager and coach. I let the person know about the conversation that needs to be had. Less waste generated in the company. Less attitude of “less play this out” which is the old attitude. I get to practical things on living the opportunities. A very practical tool! Saves so much waste! It is a better problem solving mechanism. You can’t go into a rabbit hole any more. It allows for self-reflection, clarity, and dealing with reality instead of opinions. What am I doing or not doing? This is doing that brings a much better outcome. I’m less emotional, more factual, I see clearer next steps. I have adult to adult conversations with less assumptions. I am genuinely curious. I’ve learned that my way or the highway is not the way. I can operate with less mental taxation. I am much more curious. I’ve learned that 99% of the time my biased assumptions are wrong. I learn from all these great people at work. I’ve stopped making it about me. I slow down in a more natural way instead of being irritated. I allow others to talk before I would be ready to tell them my list of things. The way people interact with me now is with happiness. Finding true collaboration instead of fear-based or stressed-based results. At work this program it has allowed me to own my truth, serving myself and serving the company. Relinquishing the head trash. Permission to be myself and live my truth, as a result I have found a place in the company that gives us a better return on investment. I wasn't a happy manager. I'm better as an independent contributor. This program gave me the space to explore this and help alleviate fear enough to bring this up. This program allows my innate qualifications and skills to shine. Shedding self-doubt and as a corollary, I can ask for help when needed. I can shift the facade of "I'm fine" when I'm not. I can shed the skin that's not my real skin. I am much more compassionate. I now own my part in relationships that I thought should be different. IBC™ has proven to be a powerful accelerator showing a measurable increase in leadership attributes after one year of practice. Throughout the last 8 years we have been offering a profoundly unique coaching certification program specializing in Inquiry-Based Solutions. Currently, several dozens of graduates share their insights and discoveries with others all around the world. Innerland’s One Year Program is a master class in the Self. 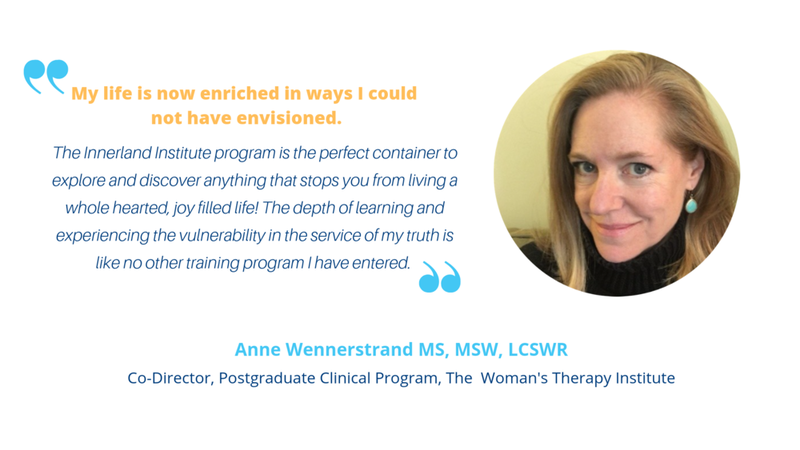 The intimacy that grew within the group of people over the year, through partner work, in person, workshops, and teleclasses, was integral to the support needed to dive deep into ourselves. The highlight is certainly the graduation retreat, however, the experience wouldn't have been the same without the grounding of the year-long work. Tania and her Innerland team where unfailingly supportive and present for us. The curriculum provided was generously crafted to unhinge and loosen locked beliefs while also providing guidance on finding the way home to Self. I wouldn't hesitate to recommend this program. I've just about finished the year long training, and it has been literally life changing for me… and that's what I've been doing: the power of precise and sustained inquiry, and the difference between doing it once in a while, and being totally immersed in it, as we have been. I'm so grateful for the container that has held us. Doing the One Year Training Program has given me the tools to learn how to live with greater honesty, integrity, and with self-love. I came to this practice feeling at war with myself most days, unable to be aware and accept the many truths and aspects of my conditioning. The kindness, generosity and astuteness of group leader Tania Fierro, of the group as whole and of each individual within the group, has allowed me to share myself more fully and more openly with less fear and less shame than I have ever had. I have become more curious and often find humour to see what lies at the foot of my often-insane thinking. The support from our group and the continuous practice has allowed me to travel safely in recesses of my mind I might not have had the courage to explore on my own. I strongly recommend this program; it has done so much for me. Tania's artful guidance blends fierce honesty, humour and humility and encourages us to move beyond the surface of our existence. Her lively and enlightened approach has helped me unpack mountains of interrelated, limiting beliefs and long-held behavioral patterns that weren’t serving me in my personal or professional life. I highly recommend Tania to individuals or groups who are ready to step toward a deeper engagement with life. Pedro is a master of "...educating in the radical sense, i.e., Latin “educo”: to draw out or bring forth (that which is already within)"
~ Richard F Hay, author of "Out of My Mind and Back to My Senses"
Innerland provides a structure and community to support participants to dive deeply into these transformative processes. My relationship with my family, work and creative passions has transformed 180°. Pedro is the rarest and best kind of teacher: He not only empowers those around him to walk the path for themselves, he empowers them to find the path. And he does it from the power of finding his own. He is a living paradox. His mind is sharp, honed like the blade of a sushi chef, but he has put it to work unraveling the mind. What a gift!